I graduated from the African Leadership Academy in June 2015. I found that going to college this year was not the right step for me so I decided to take a gap year in Egypt. I still I don’t know if I regret this decision or not. Every day in Cairo has been a real battle. Walking through the streets of Cairo, I fight a battle against people’s eyes checking every part of my body; I fight a battle against people’s oppressing words. I fight a battle against harassment. The battle is silent and passive. It eats parts of me everyday. One time, I was trying to get a taxi in the middle of the day, a private car slowed down next to me. The driver asked: “Where do you want go?” I was terrified! It wasn’t the first time that something like that happened to me. I rushed in the other direction immediately without saying a word, wanting to beat up myself for another passive reaction towards sexual harassment. I also began to see the metro differently. It wasn’t the same metro that I remembered from the time I used to take it with my mother. It’s still a cheap, quick form of transport, but it’s also a continuous process of threat and discomfort: the threat of unwanted verbal or physical sexual harassment and the discomfort of my heavy heart trying to bear the stress of getting out safely. I took the photo below in the “‘women only” metro wagon. This is the solution the state found to prevent sexual harassment: to put the “weak victimized” women and the “animalistic uncontrollable” men in two different wagons. 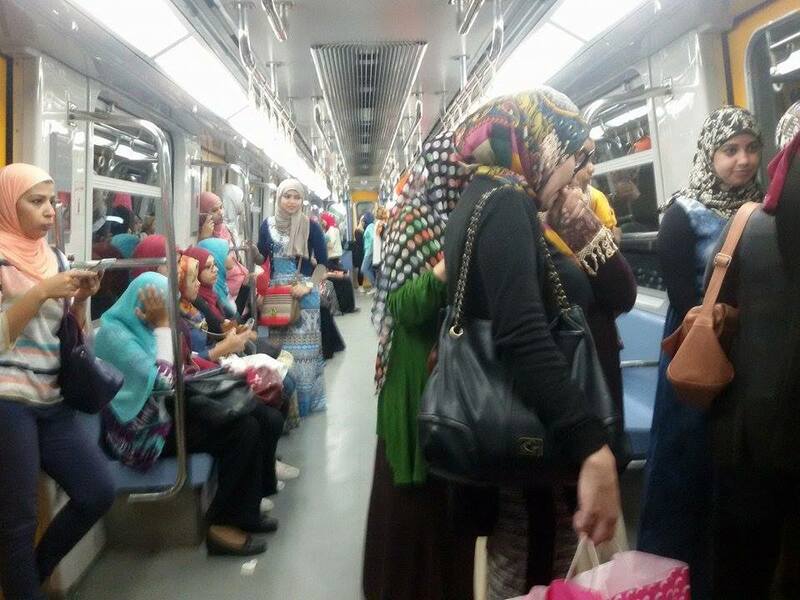 Although I see it as highly silly solution that only widens the gap between men and women, I choose the Woman Wagon every time I take the metro – not only to prevent any “unintentional” rubbing, but also to avoid feeling their heavy eyes on me. I believe in activism. I believe in taking action. I believe in standing up for others and myself. However, somehow I cannot apply it to sexual harassment. It seems that it would have been easier to be a “Tank Man” in the Tienanmen Square protests of 1989, standing up against tanks and an oppressive political system than it is to stand up against the cowardly, hungry men of my country. I feel defeated every day by sexual harassment. I feel disappointed in myself everyday for “being passive”, which has been the overall theme of the last two months. Since I came back to Egypt, I found myself pushed to take passive positions in most of the situations I am exposed to, including sexual harassment, political conflicts, etc. I also found myself being silenced by the people around me who belittled the causes I work for. They say: “ There is no need, there is no hope”. Egypt is the hardest place to take a gap year, not because of the challenges I face trying to impact or change my community, but because I am oppressed every day by sexual harassment. It is so strong, so powerful that it stops me from going to work, from having my own personal space or even from just walking down the street. Posted on November 19, 2015 November 19, 2015 by meganhallaPosted in English, Gender Equality, Past Special EditionsTagged activism, catcalling, egypt, gender equality, sexualharrassment, women rights, yala young leaders.